"Why are you so upset today?" I asked my elder daughter, holding her hand. "Nothing Dad." She handed over the bag to me as she entered home after a tiring day at school. "But there has to be something, because that is not your usual self." "Forget it Dad, I will manage." "Oh C'mon. May be I have gone through this situation before, and I can help you someway." "See, My best friend in school Neha - I always used to be ahead of her in studies though the competition was always close." "This year, she has been ahead of me, and I am not used to being in second place Dad." "But I saw your Maths score. You did much better than what you did last year." "Yes Dad...See that's why I told you that you won't understand. Yes, I did better than last year. But its not about me. I came first last year, but now since Neha has scored better than me, I will be relegated to 2nd position in the class, and I don't really like this." "Well, first I must appreciate your competitive spirit. The spirit, the fire inside - itself is very important to achieve extraordinary results in life. But at the same time, you need to learn how to orient this spirit in the right direction." "What direction? Who should I learn it from?" "Learn it from Sergey Bubka." "Who is Sergey Bubka?" asked my teenage fairy. "Sergey Bubka was a pole vault player and let me read some of his sporting achievements statistics from Wikipedia"
"He started competing on the international athletics scene in 1981 when he participated in the European Junior Championship finishing seventh. But the 1983 World Championship held in Helsinki was his actual entry point to the world athletics, where a relatively unknown Bubka snatched the gold, clearing 5.70 meters (18 feet 8 inches). The years that followed witnessed the unparalleled dominance of Bubka, with him setting new records and standards in pole vaulting. He set his first world record of 5.85m on 26 May 1984 which he improved to 5.88 m a week later, and then to 5.90 m a month later. He cleared 6.00 meters for the first time on 13 July 1985 in Paris. This height had long been considered unattainable. With virtually no opponents, Bubka improved his own record over the next 10 years until he reached his career best and the then world record of 6.14 m in 1994. He became the first athlete ever to jump over 6.10 meters, in Spain in 1991. Until January 2014, no other athlete had cleared 6.07, indoors or outdoors. He set the currently listed world record of 6.14 meters in 1994 after some commentators had already predicted the decline of the great sportsman. 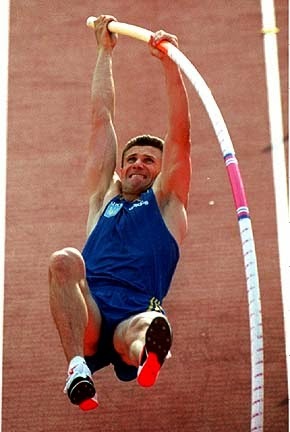 Bubka increased the world record by 21 centimeters in the period from 1984 to 1988, more than other pole vaulters had achieved in the previous 12 years. He cleared 6.00 meters or better on 45 occasions, more than all other athletes in history combined." "Wow, but what has this to do with my problem." "Everything. If Sergey Bubka would have been competing with anyone else in the world, he would have been satisfied the moment he created the first world record till it was broken. But he went on to create record after record for 12 long years - with no external competition, and became one of the greatest ever in his craft. You know what was driving him?" "He had learnt that masters compete with themselves and not with anyone else - they focus on daily incremental progress - they are not concerned with any outside competition. They do not want to limit their capability by comparing it with any one external to them." "Hmmm... I am getting it. And perhaps you are right Dad." "Dear, do not let anyone in the world decide what you are capable of. You are your own competitor. Keep improving. Keep defeating yourself, every time." "Let me come back in a minute, Dad." "I had gone to congratulate Neha on her success." Both of us smiled and hugged each other as we made determined efforts to improve ourselves against ourselves - that's the competition we must strive for.